Club Penguin Cheats by Mimo777 Club Penguin Cheats by Mimo777: Club Penguin Stormy News! Woot! A storm is a comin'! Gary the Gadget Guy announced today, that weather conditions are right for a storm. It should arrive on October 29th just in time for Halloween. Don't forget, the 5th Anniversary Party is October 24th! ONE DAY ONLY! And, the Halloween Party begins on October 29th! Awesome news, huh? Are you scared of storms? I hope not! Water. The water ninjas are next and are coming sooner than we think! awesome! and no im not afrad of stoms, i have a fear of thunderstorms. Cool, another storm! 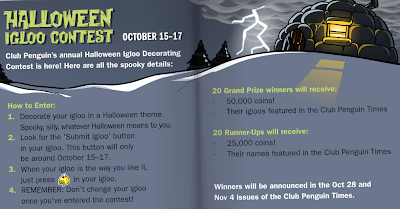 Good luck to everyone in the Halloween Igloo contest! Saweet! Another storm, halloween party, anniversary party and awesomeness! I can't wait! I think you are right because that happened last year with card jitsu fire. AWWW. my membership is done tommorow. WAAAA. but it was a good 6 months. Yep! Looks like it's green and blue this year! I was hoping it was gonna be red and black and those of you at CPS know why. 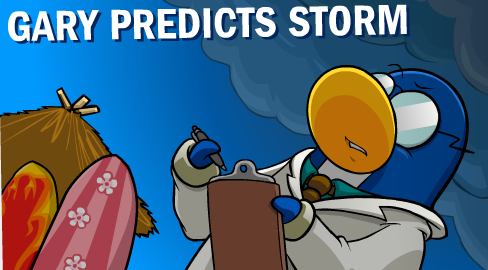 The party hat the penguin is wearing is the 1st party hat from 2006. Iy is not new. The storm certanly is cool! 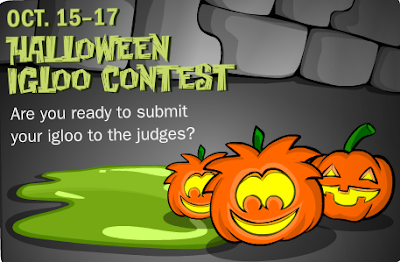 Good luck to you as well, if your entering the contest! 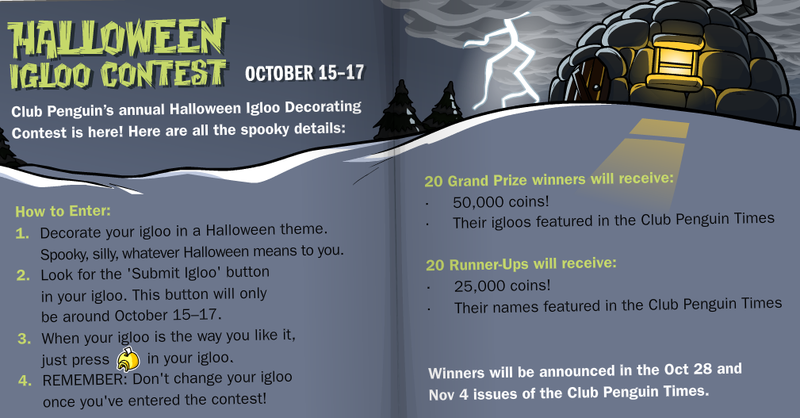 It's gonna be a VERY tricky competition to win mainly beause theres no stuff to decorate you igloo with???!!! so i just hope i win and a new catalog comes out. And good luck to everyone else entering!!! They changed clothing catolog today too!! it shows the party hat! Woo! I love the storm! Actually I like the whole Halloween party! I like the anniversary party, but it always takes like half an hour just to get into the coffee shop! And I guess blue and green are the colors this year, if you look at the party hat. I love the cake at the anniversary party! Woo! oh actually scratch that part about the party hat. Actually that's an old party hat. But good guess! Yes, this is a double modding. And actually, that party hat is an old one. Although I thought those were the colors at first, too. I think you are completely right! Great guess! I totally agree! That's the party hat from a year or two ago. I wonder what the new one will be like! That's how I feel everytime my membership ends! So I go to the store, and buy more memberships! I can't live without me memberships! You are right, it's very tricky to win! I have been trying for 4 years, and haven't won, but I will not give up! Also, the new catalog is out right now! Good luck! Actually, the hat is from 2006. But I wonder what the new one will be like? Water dossen't always fall down from storms - There is a type of thunderstorm called thundersnow which just like a thunderstorm but with snow.